The galaxy is vast and full of wonder... and resources! Best to not sit around and wait, or those resources will be gobbled up by some rival alien race. 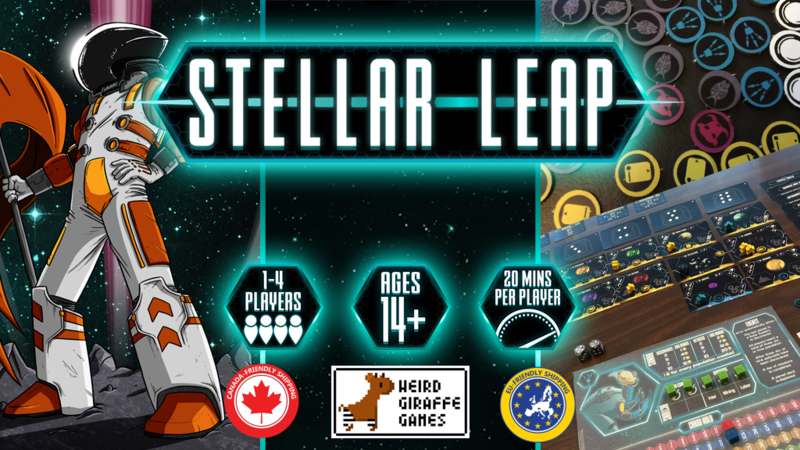 Expanding out into the stars, claiming areas for you, and placing workers to best make use of those resources is what you'll be doing in Stellar Leap, a new area control/worker placement game that's up on Kickstarter now. The elders tell tales of the time before the Great War; a time where our ancestors traveled great distances between the stars. The elders have tales of countless planets, rich with natural resources and unfathomable wealth. We have rebuilt our war-torn homes, unified our people, and mastered our natural strengths. The High Command has arrived at the consensus we are ready to travel beyond our home. We are ready to take our Stellar Leap. In Stellar Leap, you take control of an alien civilization on the verge of expanding into the galaxy. You build the galaxy by drawing planet cards and placing them strategically. You use your variable player power to influence the resources generated each turn. You then use these resources to discover more planets, complete missions, move workers to newly discovered planets, create more workers, or attack other players’ workers, all of which build your victory points and bring the game closer to the end. Some actions may bring your bonus points based on a your hidden trait while others may trigger an event that affects all players. The game is already over its funding goal with still 23 days left on the clock.